Last February, my best friend and I met in Bali. I departed from Bandung, while she departed from Osaka. 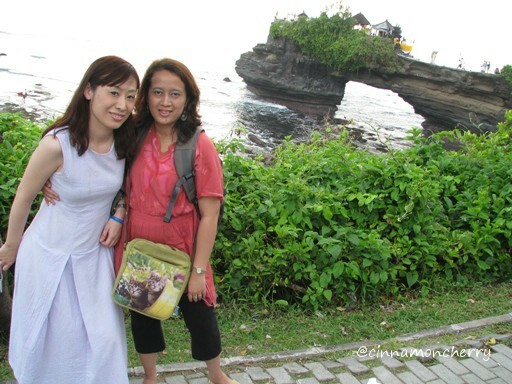 My best friend really loves Tanah Lot, with its majestic structures of stones and crashing waves. There's something peaceful and powerful in this area. Some say it's due to the presence of the sea gods, some believe it's because the place is blessed. I think it's part faith and perhaps superstition. 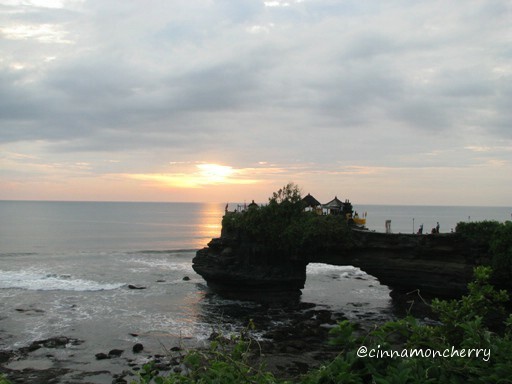 They keep Tanah Lot area sacred and inspiring at the same time. We stood there for a while, and found a cozy place to sit on. We arrived at about 5 - 5.30 PM and the wait wasn't long. We sat on the steps leading to the beach, and the view was... well, you can see for yourself here. Maybe next time we visit, we should bring a bottle of sparkling grape juice and make a toast or something. Or be philosophical and write endless poems, accompanied by the hues of yellowish-orange sun and grayish white sky and darkish sand. Yes. I am a dreamer, and I dig fabulous sights and romantic settings.